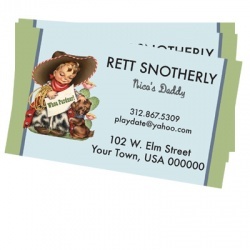 Don't be the only mom or dad on the playground without these vintage-inspired calling cards. Is Chad's mom interested in a playdate? Simply hand her one of your calling cards, and you'll be set! Communicating with other moms is a snap! Each card measures 2" X 3.5". Get some for yourself, your best gal pal, hip dad, or even that new mom at playgroup! These make wonderful shower gifts as well! Choose a set of 200 or an ample supply of 500. Simply enter your information in the fields below, and we'll have them out to you in a jiffy! Don't want to include certain information on the card? Simply leave that field empty! Special Note Please allow 2-3 weeks for printing/shipping. And discount codes do not apply to calling cards.